SEATTLE, WA—Hawaii & Philippines-themed pop-up restaurant opening for one night at Seattle’s Inay’s Asian Pacific Cuisine on Monday, October 21st. The pop-up event, titled ”Loco Moco & Sh*t” is curated by Chera Amlag and Geo Quibuyen (Prometheus Brown of Seattle rap duo Blue Scholars). In August 2013, they spearheaded the creation of Adobofest: an adobo cooking contest and block party in Beacon Hill. It was attended by over 250 people featuring 20 competing cooks. Last month, they partnered with Inay’s Asian Pacific Cuisine, the longest-running Filipino restaurant in Seattle, to host their first pop-up restaurant “Gumbo & Sh*t,” which was a rousing success attended by over 100 enthusiastic diners. Loco Moco & Sh*t will be open from 5pm to 9pm. 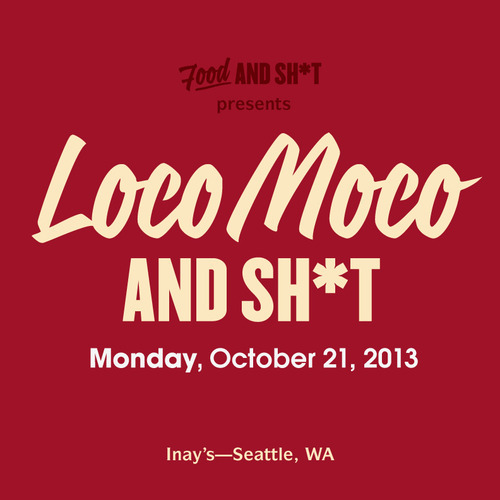 Go to Loco Moco & Sh*t Facebook Event page here.